Verve Cycling designs and builds innovative bike parts for the road cyclist. What makes Verve bike components stand out from the crowd is their real-world accuracy and reliability. At Verve, we strongly believe this is the key innovation for efficient and rewarding cycling training and bike performance. Our first bike parts product is the new-generation InfoCrank cycling power meter. It’s a fresh new crankset design with an integrated power meter built with the latest materials science, fabrication methods, and communication technology. InfoCrank is built for the road cyclist for day-in, day-out usage, in all weather conditions. It exactly measures the load in left and right legs, separately. There’s no guessing, no mathematical derivation: just precise measurement. Our bike crank delivers unsurpassed accuracy every time, all the time. You can always trust the numbers. That’s what you need when your goal is to truly improve your bike performance. We believe it’s the best cycling power meter on the market today. InfoCrank is a new generation of cycling power meters. 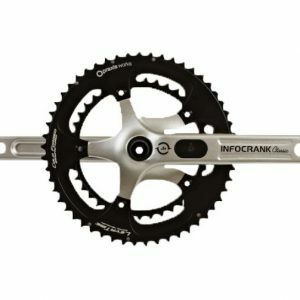 Designed by Verve Cycling, the InfoCrank bike crankset sets new standards of accuracy, usability, and robustness. And because it’s built for the road cyclist, our bike parts are not just guaranteed for the lifetime of one bike, but of all the road bikes you will own. 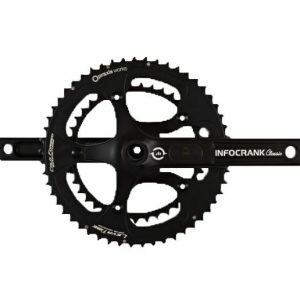 InfoCrank’s power-meter functionality is integrated into the bike crankset, the hard point of every bike. Classic-format race double on 130 mm BCD spider: integrated power meter in each crank accurately measures power produced by left and right legs and sends high-grade dual datastream to ANT+ head units. Stiff, lightweight cranks come in three standard lengths and are fit for every kind of racing and competition; finish in satin-anodized silver or black.